Topographic map patterns seem to be really popular at the moment with designers who are wanting to capture the trendy vintage outdoors style in their work. They’re made up of lots of thin contour lines which bend and warp to form interesting shapes, which makes them great for filling out the background of your designs with a subtle pattern. A few weeks ago I showed you how to create a contour map effect using Illustrator’s Blend tool, since then I’ve been busy playing around with loads of different topographic map styles to produce this free pack of seamless repeating patterns for you to download. This free pack of topographic map patterns contains 8 seamless patterns in vector EPS, PNG and Photoshop PAT format, making them perfect for any kind of project. The repeating PNG images can be set as a website background, the vector patterns can be scaled to any size and the Photoshop PAT file allows you to quickly fill a massive area. 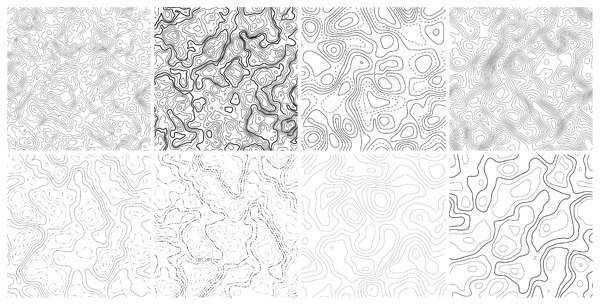 I’ve made 8 variations of contour lines with different levels of line thickness, density and style.